You’ll find the Coral Lagoon Lodge on the shores of the bay of La Cienaga nestled between the mountains of Venezuela Henri Pittier’s National Park Caribbean coastline and located only 3 hrs from Caracas airport. The waterfront location of our Coral Lagoon lodge offers allows you to discover the tropical marine environments whilst you enjoy some of the best Venezuela snorkeling, diving and kayaking right off our doorstep. 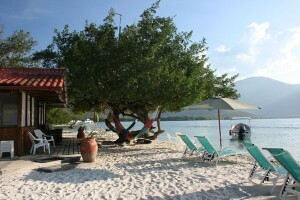 Accessible only by sea, the lodge is a great place to get away from it all and relax swinging in a hammock on the water’s edge under the shade of the mangrove trees. 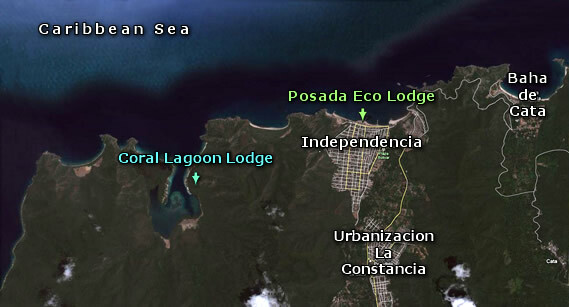 To get to the Coral lagoon Lodge of La Cienaga you can arrive by sea with your own vessel or if you come by land, the meeting point is the De La Costa Eco-Lodge (click here for map and directions) . Here you can leave your vehicle parked and we will take you by land to the towns pier and then to the Coral Lagoon Lodge of La Cienaga – a trip of approximately 15 minutes by boat.